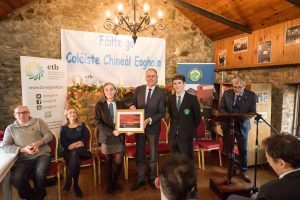 D’oscail an tAire Oideachais agus Scileanna Joe McHugh seomra nua adhmadóireachta I gColáiste Chineál Eoghain Dé hAoine seo caite. Bunaíodh Coláiste Chineál Eoghain, atá suite i Muileannn Thulaigh Gharbháin, Bun Crannacha, sa bhliain 2007. 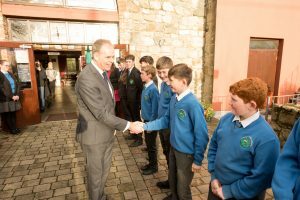 Bunaíodh an scoil chun oideachas a chuir ar fáil do dhaltaí Inis Eoghain trí mheán na Gaeilge. 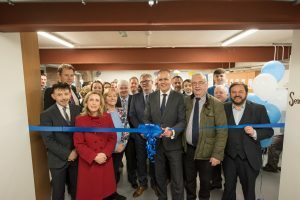 Tá réimse iomlán ábhair an tSraith Shóisearach agus Ardteistiméireachta ar fáil, agus chuir siad clár Idirbhliana ar an churaclam le déanaí. Leis an tseomra adhmadóireachta nua-aimseartha seo, cuirfidh seo leis an churaclam go mór do na daltaí Shóisearacha agus Ardteistiméireachta. 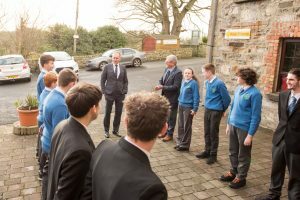 Cuirfidh sé le go mór leis na hábhair ETIM (Eolaíocht, Teicneolaíocht, Innealtóireacht agus Mata) atá ar fáil sa scoil do chailíní agus buachaillí. Ag lainseáil an tseomra ranga nua, dúirt An tAire Oideachais agus Scileanna Joe McHugh, ‘Is í Coláiste Chineál Eoghain an t-aon Gaelcholáiste in Inis Eoghain agus ba mhaith liom daoine a spreagadh leis deis a thapú agus tabhairt faoin oideachas dara léibhéal a bhaint amach trí mheán na Gaeilge’. 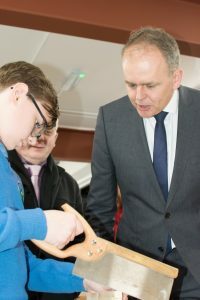 Minister for Education and Skills Joe McHugh, TD, opened a new woodwork room in Coláiste Chineál Eoghain on Friday last. 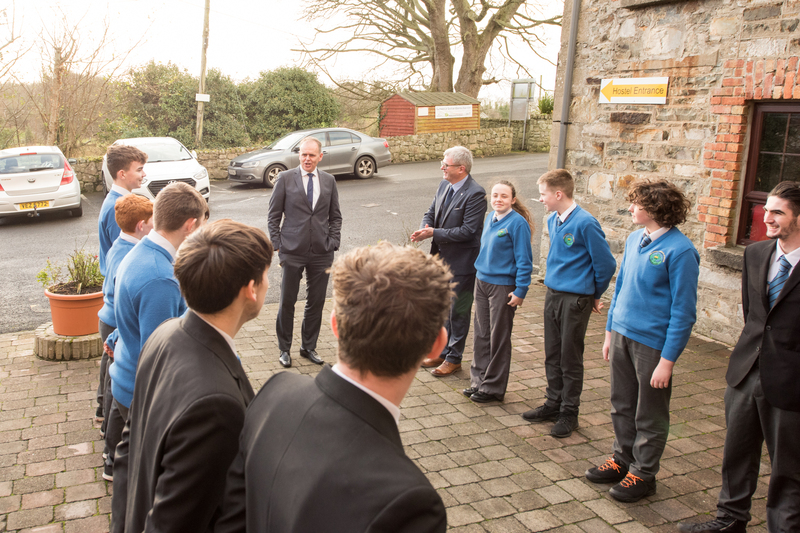 The school, based in Tullyarvan Mill in Buncrana, was established in 2007 to allow pupils from Inishowen to pursue their second level education through the medium of Irish. 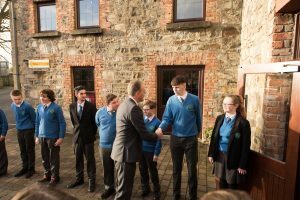 It has a full range of subjects at both Junior Cycle and Leaving Certificate and has recently added a Transition Year Programme to the curriculum. The addition of this new state-of-the-art woodwork room will further enhance the curriculum provided to both its Junior and Senior Cycle students. 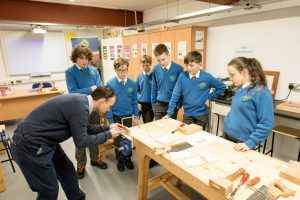 It will contribute significantly to the suite of STEM (Science, Technology, Engineering and Mathematics) subjects on offer in the school for both boys and girls. 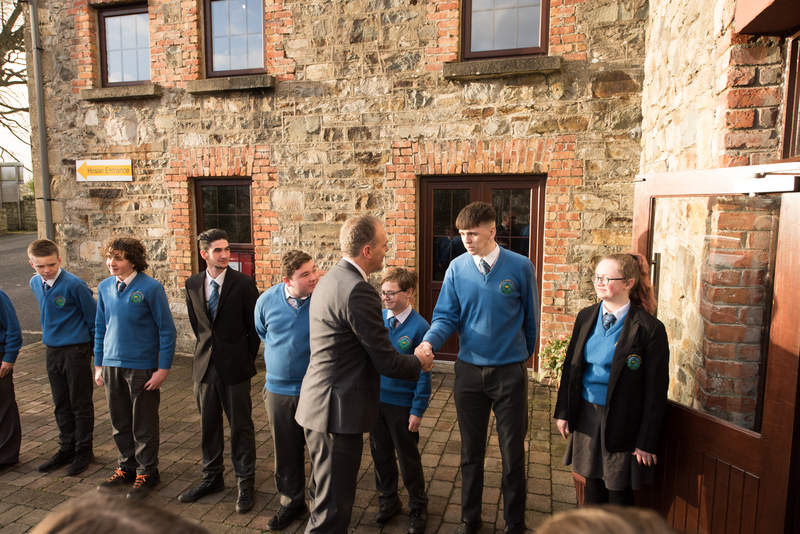 Daltaí agus muinteoirí Coláiste Chineál Eoghain ag cur fáilte roimh an tAire Oideachas agus Scileanna, Joe McHugh. 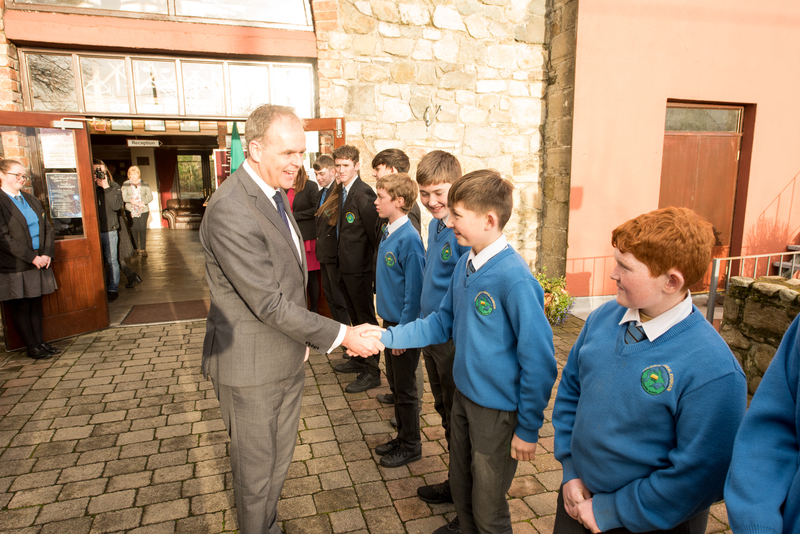 Fáilte mhór ó daltaí CCE roimh an tAire Oideachas agus Scileanna, Joe McHugh. An tAire Oideachas agus Scileanna, Joe McHugh ag caint le daltaí CCE. 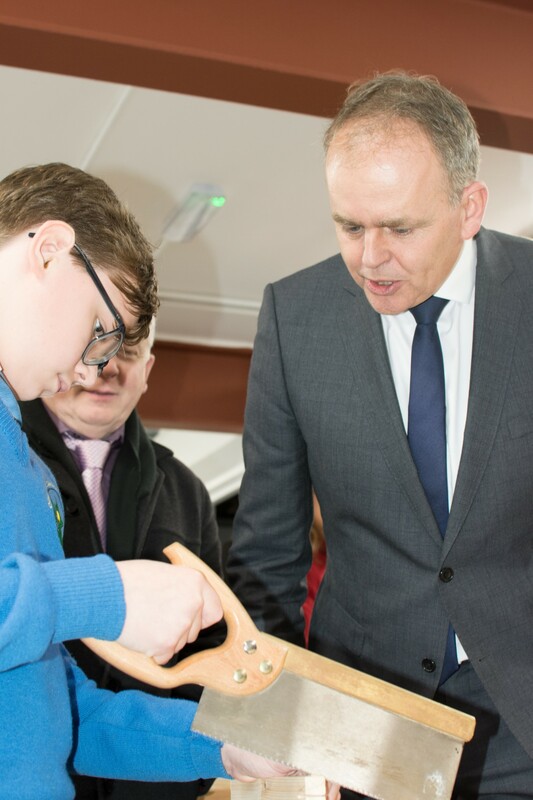 An tAire Oideachas agus Scileanna, Joe McHugh leis an slua mór d’aíonna speisialta ag gearradh an ribín sa seomra nua adhmadóireachta I CCE. Elliot Yeoman, dalta bliain 1, ag obair le Peter McLaughlin agus an tAire Oideachas agus Scileanna, Joe McHugh, ag breathnú. Muinteoir James Cullen, muinteoir adhmadóireacht ag obair sa seomra nua le daltaí ó bliain 1 agus 2. 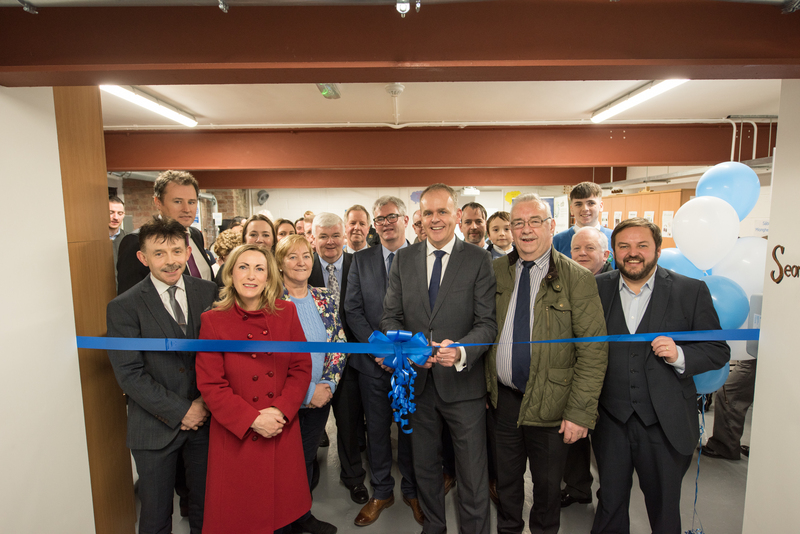 John McCarron, Cathaoirleach Bord Banaistíocht CCE, Príomhfheidhmeannach BOO, Dún nan Gall, Anne McHugh, Dearbhla Nic Cearainn, An tAire Oideachas agus Scileanna, Joe McHugh, Art Mac Pearcín, agus Stephen Doherty, Príomhoide Gníomhach, CCE. Ghlac an tAire griangraf luí na gréine ó Bhun Cranncha. This entry was posted in Coláiste Chineál Eoghain. Bookmark the permalink.